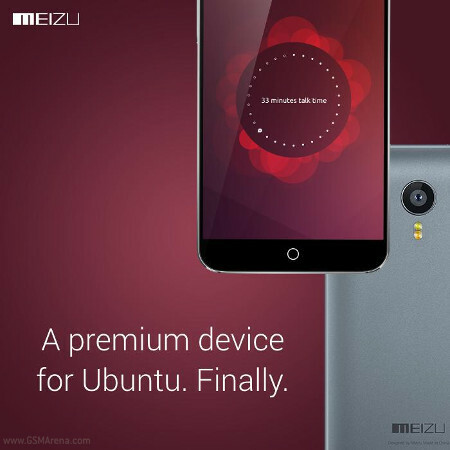 For almost two weeks now Meizu has been teasing the upcoming release of the Ubuntu-running edition of its MX4 smartphone. At first, things were pretty cryptic, but yesterday the Chinese company published the first official screenshots of Ubuntu running on the MX4 – so all was clear. Today it’s keeping the teasing campaign going with the image you can see below. So we get yet another confirmation that the Meizu MX4 Ubuntu Edition will finally become official during MWC next week. Meizu even found time to take an ever so subtle jab at the BQ Aquaris E4.5 Ubuntu Edition, which was the first ever handset to run the mobile version of the OS. But indeed that is no “premium device”. We expect the Ubuntu-running MX4 to come with the same specs as its Android-touting sibling. That means it will have a 5.36-inch 1,920×1152 touchscreen, a 20.7MP rear camera with dual-LED flash, a 2MP secondary shooter, 2GB of RAM, and a 3,100 mAh battery. At the helm should be MediaTek’s MT6595 SoC, coming with an octa-core CPU with four 2.2 GHz Cortex-A17 cores and four 1.7GHz Cortex-A7 ones.